As you might know I have two projects ongoing at the moment. One of them is the “G380 on steroids“, a Goblin 380 with only one goal, getting it to go more than 200 km/h. And that is going on really nice actually. Other is the speed measurement system Sleipnir. Also going on very nice at the moment, so here’s the updates on both projects. After the first flight I realized that there is issues needing attention. The error I did originally was calculations. Or to be precise, lack of them. The 12S setup with 1250mAh batteries just did not deliver enough current. After doing the math (this time) I decided to go with 10S setup. This results in more available current (from 12S ~45A to 10S ~80A) and the motor running on better RPM-area. The motor got an overhaul from a Finnish rewinding-guru, J@ni. The same guy have worked on my 800 Xxtreme motor so it was only natural he’d be the one giving the MSH 880kV (Scorpion 3026) a new life. The results were over the top, once again. We talked a few long phone-calls, there was an overhanging risk of saturation due the massive amount of new copper in motor and the relatively weak magnet in the motor. Turned out the motor worked like champion it is. The motor is now a 12N10P 7+6×1,06 with 871kv. The orginal kv was not the 880 it should’ve been, it was 925kv running the original RPM-calculations out of the window. After getting everything fixed, new servos (2 of 3 broke on last “landing”) and new batteries it was time to hit the field. This time everything worked exactly as it should. The goal is 200+ km/h. And I mean honest 200km/h. This looks very promising. 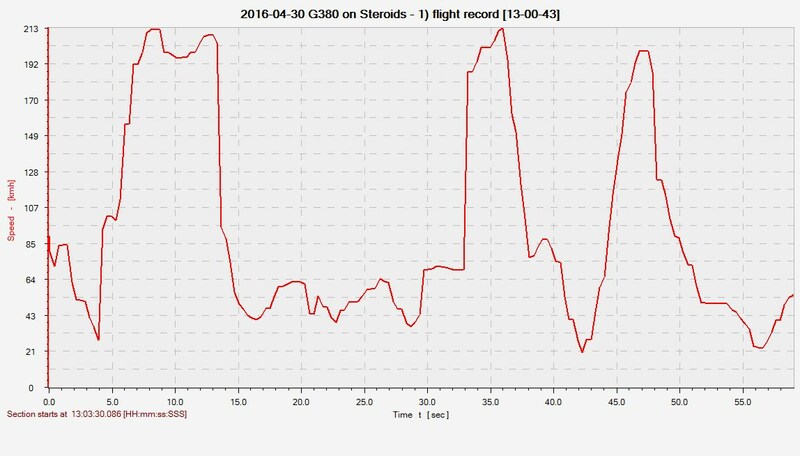 This was the last flight of the day, after this I raised throttle-curve a few notch since there is more to give. Unfortunately rain stopped this test. I was looking on the log-files after the flight and everything is very promising. For example PWM never goes to 100%, on speed-run PWN is between 90-91% so obviously motor can give some more. The run seen above was with stock SAB 380 blades and 17 degrees of pitch. There’s still only 4-5 flights on this so looking for the sweet-spot is still ongoing. I do believe that the pitch should not be that high, I’m thinking 15-16 should be enough. Also the RPM can be raised from the ~4000 RPM it is now on speed run. The fact that I’m this close to 200km/h this early in testing is very promising! How fast is fast (controllability)? Global voice-title to sensor announcement?